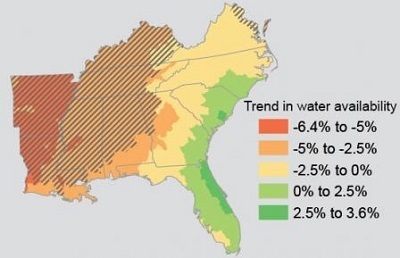 ﻿ Fun Easy English - Environment - Global warming - Climate change Impacts in the Southeast. 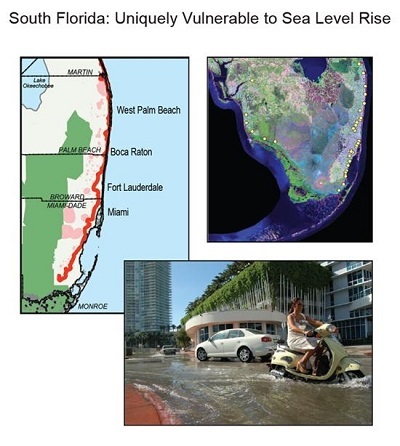 Picture - Sea level rise in South Florida is creating new challenges for coastal water management. This area has an elevation close to sea level, and residents are already experiencing seawater flooding in streets (lower photo). Freshwater supplies may also be threatened as seawater moves closer to existing well fields (left map: pink areas are well field protection areas and the red line is the current interface between saltwater and freshwater). Aging flood control facilities (right map: yellow circles) originally built at the ends of drainage canals to keep saltwater out and provide flood protection are also being threatened by sea level rise. Sea level rise will erode shorelines, inundate wetlands, and impair the operations of coastal infrastructure. 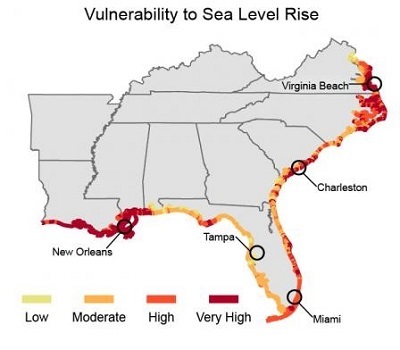 Low-lying coastal areas are at higher risk from frequent floods and storm surge. Low-lying inland areas could see increased flooding from rain because stormwater drainage systems are at risk of seawater inundation and slow draining. The Southeast has numerous cities, roads, rail systems, ports, airports, water supplies, and oil and gas facilities located near sea level. Damage to this infrastructure will have large economic impacts. In general, the Southeast has had water resources capable of supporting local populations, ecosystems, agriculture, and energy production. However, parts of the region have experienced droughts, and anticipated population growth and changing land-use are likely to add further strain to the water supply. Clean water availability is expected to decline in the future, resulting in new water resource management challenges. Freshwater availability can be impacted by many climate-related factors. 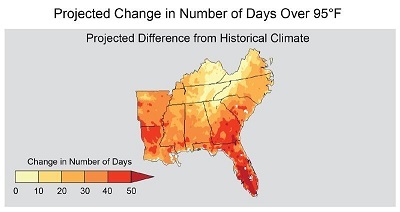 Projected climate change will stress human health in the Southeast. Higher temperatures and more frequent heat waves will increase heat stress, respiratory illnesses, and heat-related deaths. High temperatures also contribute to poor air quality, including the formation of ground-level ozone, which poses a risk to people with asthma and other respiratory illnesses. Ground-level ozone is projected to increase in the 19 largest urban areas of the Southeast, likely increasing hospital admissions due to respiratory illnesses, emergency room visits for asthma, and missed school days by children. 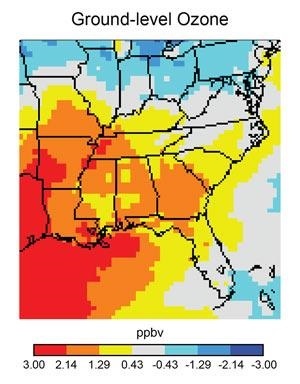 Picture - Ground-level ozone is expected to increase across most of the Southeast as temperatures rise. Ground-level ozone, an air pollutant, is a component of smog that is harmful to human health and may increase the likelihood of death. This map shows projected changes in average yearly ground level ozone concentration in 2050 as compared to 2001 in a scenario where greenhouse gas emissions are gradually reduced beginning around mid-century. (Figure source: adapted from Tagaris et al. 200940).